Paint Care Ask questions, seek advice, and share techniques about exterior paint care. "Old man look at my life, I'm a lot like you were." ------Neil Young. Often I come to these fora, and in response to a request from a new guy, I’ll give a detailed reply. Sometimes you come across a thread that needs no response at all, and one such thread was from Stanger saying how he wasn’t looking forward to Winter. However, what it did make me do was to think about just that. I know how you guys have some difficulties during the Winter months, depending upon where you are in the US, or the World for that matter, Canada, Hong Kong, The Philippines, Alaska, or even Australia for that fact. Winters can be harsh no matter where you are, but some places more so than others. This makes the task of caring for your car more difficult, and this subject has often been mentioned here at the Forums. I looked at just that, and in so doing, it made me look at some of my own posts. Most of you are aware that sometimes I have a little rant about the water situation here in Australia, how it’s become almost a crime to wash your car, because the perception is that in so doing you are wasting precious drinking water, so the State Government has made the home washing of cars in the normal way, with a garden hose hooked up to the tap illegal, and are even propounding that anyone seeing persons using this method to wash their cars should phone a Hotline and put them in. If proven to be in contravention of the new law, they turn your water pressure down to just a minute trickle fro 7 to 10 days, make you pay a fine, and then name and shame you. I’ll rattle on about it grumpily every so often, but introspection on this ‘Winter’ thing led me to look at these rants on my part. I’ll come in and offer a solution for a new guy with a question, yet I wasn’t even thinking of applying the same criteria to finding a solution for my own problem. So, I thought, maybe I might be able to deal with both matters with one response. I thought that I’d try an experiment. If it worked, I thought I’d ‘post’ with the results, but that put me in a quandary. The results might be successful, but there’s degrees of success. If unsuccessful, simple. Don’t post, and forget it. Nice try. If that success was marginal, the worth in posting might also be marginal, and probably might be problematic, as something like this, not actually tested by the Chemists, or R and D at Mothers, might see the people at Mothers not only not recommending it, but then having to diplomatically try and hose down what I say, aware that something untried like this might lead to more problems than the single one it tries to resolve. Then, if it did prove more successful, the same would apply as for a marginal success. The safe thing to do, if it proved successful in any way would be just to keep it to myself, quietly use the method for myself, and that way, everyone stays happy. I persevered with the Scratch Remover till I got it right. I persevered with the Back to Black till I got that right. Same for the Protectant. Chrome polish on glass. Varying qualities of microfibre polishing cloths, applicators both foam and MF, drying towels. Same for the eraser trick with the white stuff on the black trim thing. I’ve used four different ‘systems’ on four cars to evaluate each so I know how to use each of them, the effects, the ease of use, the results, the longevity. My problem, and hence my rant was with the car wash itself, and only because of the inability to use water from a tap via a hose. I used the recommended method only a couple of times before washing your car became akin to more than a misdemeanour. Then, the only recourse was actually to use the automated car wash. It even got to the stage where the proprietors of these places said no to using their ‘manual’ facility, and using your own products after hours to wash your car. The only recourse was that I had to drive down the tunnel. Luckily, I found one where only the suds and the water touched your car, but it was still fraught with danger in my books. Water pressure. Filtration. Clean water. Clean suds. Then they thought they were offering an extra service with young guys and mitts assisting the process, those mitts seeing more service in a day that your mitt might see in a year. Each time I used the facility, I figuratively held my breath. The cost at $18.00 a time also offended me somewhat. I could get away with it once a fortnight, but it was still costly, for a guy and his good lady wife just getting by on a meagre Air Force Superannuation. However, what all of this did do was to make me think laterally, and to employ cleaning my car before and after each use, the duster before and the Showtime with a microfibre cloth when I got home, or if it had rained, then to dry it all off. This way, the car stayed (relatively) clean all the time. But once a fortnight, I still had to drive into the tunnel. There had to be another way. I looked around for something I could use to wash my car without wasting water, because after all, even though the public might see people who actually want to wash their cars as aberrant types, maybe redneck in nature, some of us are responsible types who might actually want to look out for their fellow man, and the environment, and still keep our cars looking nice. So, I went looking for something that might assist me in what I wanted to do. What I found was not very much, but in the main, anything that did try to ‘cash in on’ this situation was in the main basically an Instant Detailer, masquerading as a water saving car wash, and nearly all of them intoned the same thing, that of using care not to use this product on a really dirty car, to be careful as you used it so you did not introduce marring, by moving particles of grit around that might scratch the painted surface, and all of them, bar none, also said, usually in BOLDER TEXT, that this product was not meant as a replacement for a full normal car wash. In effect, what they all did was to answer the question by not specifically answering the question. One Company even devised a plan to get into your wallet, Oh! Sorry, to solve the problem by having a medium sized duster, a small bottle of Instant Detailer with different labelling and a microfibre polishing cloth, all marketed in a ‘flash’ box, with environmentally conscious text, and all for only $50.00, without actually mentioning that the small bottle of what was basically an Instant Detailer might only last for one application on your car. So, in all reality even though this provided an answer of sorts, it was still not what I was looking for. I did however find something, and it was of my own making, an adaptation of a lot of things coalesced into one. It would just be too easy for me to say, ‘Yeah! I did it.’ and then to explain how. However, for it to have any credence at all, the process needs to be put to a test with a control. I needed to cover all the bases so that I could actually compare any new process to a control. To that end, I engaged all five methods of washing the car. 1. The standard, original, and recommended one you see here as the sticky near the top of this Forum, and one that we religiously recommend to every new guy, because this alone is where any owner induced marring can occur. 2. The pay $18.00 drive into the tunnel car wash.
5. The new method I’ll explain in the next few posts. Now points 1, 2, and 3 have good documentation on them, I have used them, and know of their relative good points, and their pitfalls if any. So, I needed to compare the QEW and the ‘new’ method. To this end, I actually had to allow our car to get dirty, and this was actually anathema to me, because I have gotten so used to ‘every time’ care, and the car is in the main, always looking pristine, and even though it sounds intensive, it takes up so little time as to be almost negligible, and has become routine. Now, here was the first revelation. Try as I might, it actually proved difficult to get the car dirty, except for the wheels as is the case with most ‘Euros’ and their brake dust. Because the car is waxed, there is the phenomenon of water beading, and once in motion the beads join up and the water just flows off the car, so that when you do arrive home, there is not as much water to dry away as there might be on an unwaxed car. Another part of this same revelation was that any dust that then settled into the remaining water beads, and might have turned into a muddy deposit, (when mud is the only explanatory word I could find) it actually looks like it would just wipe away, when before, on a car not clayed, polished, sealed and waxed, this muddy deposit actually adheres to the paint and requires actual agitation to remove it from the paint. What this most effectively showed me was that if the car is clayed, polished sealed and waxed, the surface is so smooth that the dirty deposits have very little to aid their sticking to the paint. I put this down to something I’ll refer to as ‘Surface Friction’, and trust me I haven’t invented that . I just put the two words together because it best explains the why of this. 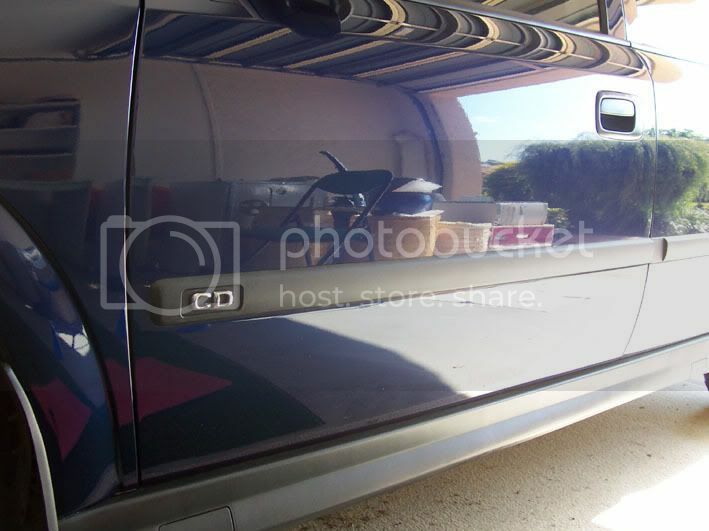 Untreated, your paint has numerous peaks and valleys caused by imperfections, and particles embedded in the paint. These effectively make the surface rough to the touch, something you all notice before claying, and the thing we like to draw your attention to, because the before and after best demonstrates just what clay does to your paint, and that is to make it as smooth as is possible, for the next stage. Polishing smooths it (albeit microscopically) even further, sealing it fills up any microscopic valleys, and that last coat of wax adds again to the overall smoothness and slipperiness of the paint, as well as being the ‘sacrificial layer’ of protection. So, if the Surface Friction is so low, then any dirt might just slide off as those beads of water also slide off your paint. This was the revelation, the fact that it was actually difficult for the car to get dirty enough to be in need of a wash, not once, but twice, because I had to use the last 2 steps of the control, that of using QEW, and that of the new process I was going to try. I had to drive in the wet, and luckily it rained a few times for me. I got to drive regularly through construction zones twice a week, and a couple of times during rain, and this most effectively highlighted the fact that the dirtiest parts of the car are the rear vertical panels, (the venturi effect) and those places on the lower panels immediately behind the front, steered wheels. Still it took me four weeks to get it done, to get the car dirty enough (twice) so it was in a condition where it actually did need a wash, well, to my satisfaction, that is. I’m using the brand name QEW here at the Mothers site not to advertise that product but to highlight the second revelation that opened itself to me, so to you people at Mothers I humbly apologise and sincerely hope that you allow me this specific latitude to explain why. I used the new method as the first of the latter two, and then, the last step of the ‘control’ that I carried out was with the QEW. Using the QEW was odd in its own way, because I’m so used to suds, that the fact that there was none was a little disconcerting, but I was really glad that I actually used this method, because, after, when I sat down and compared all the steps, this one alone with the QEW caused ‘the penny to drop’ for another of those ‘Eureka’ moments. What that dropping penny was is this. The QEW just looks like water as you apply it to your paint, but when you look in one of the two buckets, the one with the QEW soap in it, there are no suds. However, what you do see is this. The mix is a light blue in colour, and you can see that the water is filmy. What this indicates is that the soap is ‘in suspension’. The soap has mixed effectively with the water, and what it is actually doing is adding lubrication to the water, so, as you move it around on your paint, this lubrication allows the mitt to slide across the surface in a more slippery fashion, the mitt drawing the dirt particles from the paint into the nap of the mitt. 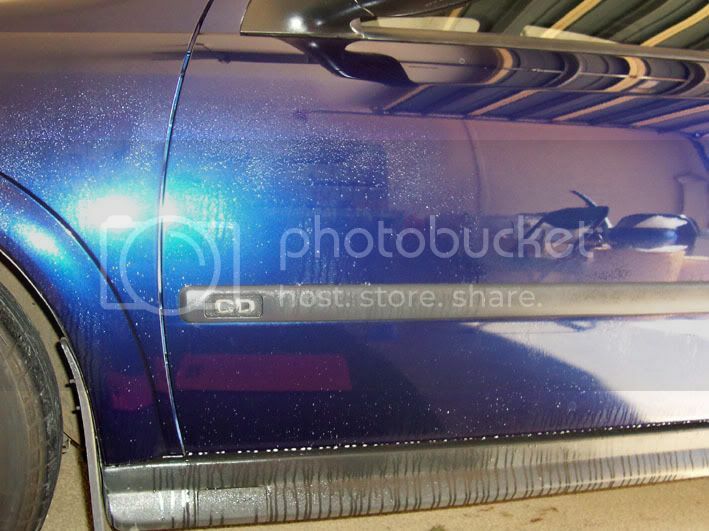 During a normal suds wash, you cannot see through the suds to the paint surface. You just trust the mitt draws the dirty particles into the nap. I’m not saying that in this case with no suds that you can see the dirt particles, because you can’t. You’re still trusting the mitt to draw the particles into the nap. So, the QEW performs the same task as the suds soap only without the suds. The soap medium acts to provides slipperiness to the water. Admitted, there is no rinsing, or a final sheeting rinse, just a wipe dry with the drying towel, place, pat and lift, and then a final inspection to see if it needs a run over with a polishing cloth, but really, it didn’t need that. Because the next step was a quick once over with the FX Spray Wax as a topper. The pitfall with this process and that also stands for all but the hose wash and the tunnel wash is that there is no pressure of water flow to get into and behind trim and into wheel wells etc, but this and those others are only an ‘as necessity dictates’ car wash. So, the QEW was highly effective for that one reason. It showed me that the soap is in suspension, and whether or not there are suds, you are still trusting your mitt to lift the dirt particles into the nap, and then the rinse to flow the remaining particles, if any, away. For the ‘new’ process that I’m going to explain to you, be advised that I haven’t invented it, or even improved on it, or even copied it. I’ve just approached it from a different direction, so no credit should come to me for this. I’m just the guy who thought to do it like this, and anyway, no one really owns a process. Because this is something I’ll need to explain, I’m going to detail it as intricately as I can, and that way, if any of you feel the need to try and replicate it, then nothing will be missing that might leave you caught between a rock and a hard place. To this end, where possible, I’m going to include photographs, because saying it and seeing it are two different things entirely. What I attempted to do was to use Mothers California Gold Car Wash, only instead of in a bucket with a mitt, and a running hose, I wanted to use it in a spray bottle in a manner similar to that use if you were using an Instant Detailer to do the wash.
Having said that and then actually breaking it down can be guess work, so what I did was this. I trusted the people at Mothers. Is it just coincidence that measuring Car Wash is topical at the moment, or am I just noticing it because I’m also writing about it. On the Mothers bottle it says, ‘Pour small amount (about one ounce per gallon) of Car Wash into bucket. Is that one ounce, one fluid ounce, one US gallon, one Imperial gallon, and what size bucket. So, trust Mothers. The guys there have worked it out exactly how much to use to best effect. The one ounce I worked out according to the bottle itself which is 16 Fluid Ounces, and luckily, here in Australia, the bottles are also marked in Metric measure, a legal requirement. One gallon. The big market is the US, so that I took to be a US gallon. Now how many of you measure out exactly. 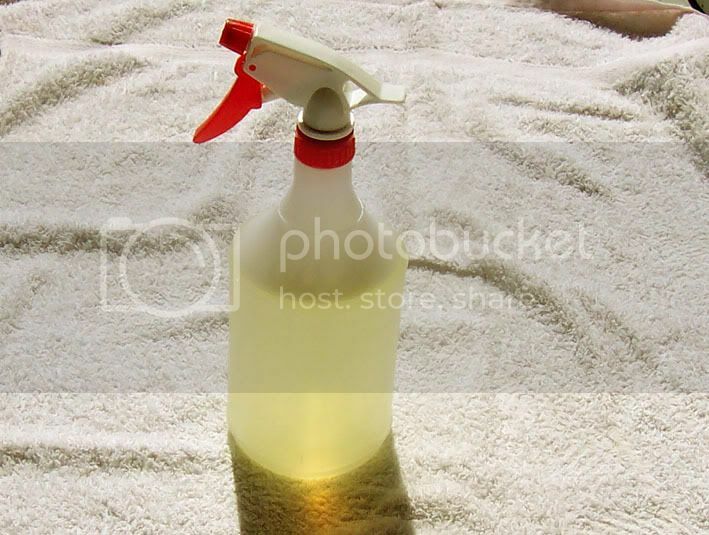 One gallon is approximately half of one bucket full, so squirt the Cal Gold Car Wash into the bucket. Put in the hose froth it up, sink the hose below the water line till the froth reaches the top of the bucket. Looking down into the froth, most of you will find that the bucket is just over half full of water and then on to the top with froth, so, realistically, this measure works out just about right. So, if the people at Mothers got that right, then surely, this amount would be in approximately the same ratio whether you worked it up for the Mothers travelling rig, or consequently worked it down for a spray bottle. What I had to do was the math. I had to convert from fluid ounces to millilitres and US Gallons to litres. Then, it’s all pretty worthless if I can’t then work it out for you guys back there in the US. So then I had to convert the small amount of millilitres to an amount you guys might recognise, and the spray bottle size to a size you guys could identify with. The end result was this. I wanted to use a small one litre spray bottle, valiantly hoping this might be enough to do my car. One ounce per gallon translates to 10 millilitres of car wash per one litre of water. Means diddly to all you guys eh! except for those guys in Canada, who are now saying thanks Tony, that’s easy for us guys. For you guys in the US one litre is real close to one quart, and ‘kbshadow’ sent me a couple of sites for hardware store chains in the US, and I now know for sure that you have access to one quart spray bottles. The next one is a little difficult, but there was a relatively simple answer for this one too. Go to a Pharmacy. (I think you guys call them drug stores, while we call them Chemists.) At the pharmacy find one of those small medicine measures. You don’t need an expensive glass one, just one of the cheap plastic ones. On the side is marked small liquid measurements, and because most liquid medicines are meant to be taken in very small amounts, these measurements are in the main, measuered in millilitres. ‘kbshadow’ also sent me some sites for Pharmacy chains in the US, so I know you can get these medicine measures there in the US also. 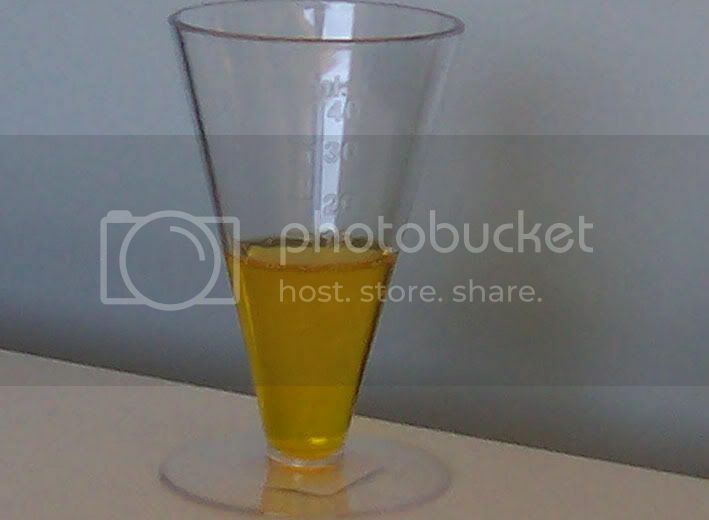 For those of you who cannot find one of these small plastic measuring cups, the above measurement of 10 millilitres is 2 teaspoons, and for those of you who need it in US measurements, find a cookbook, and more often than not there’s a measurements conversion table for small measures in the back of most cookbooks. So, now that the math is out of the way, let’s get into the actual task. When you see the first photograph and read the text, most of you will most probably think that it looks like too much work, and I agree that it does look that way, but once started, it turned into an easy task. 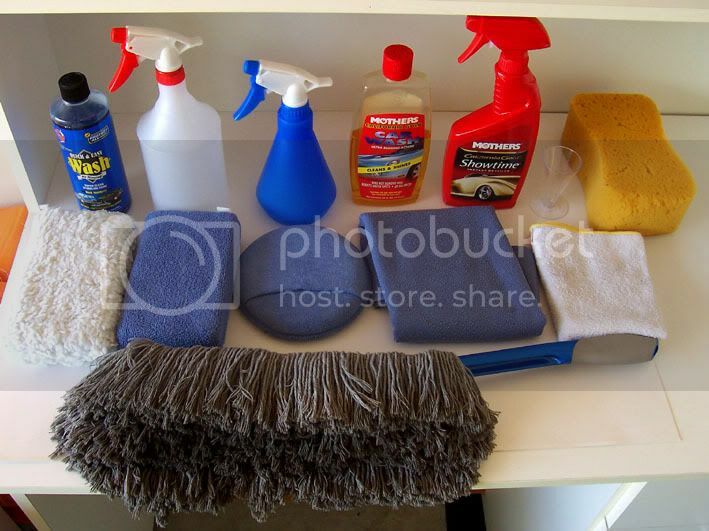 Shown in the following photograph are the items and products I used for this task. Okay let’s look at the products then. Back row left and middle row left. QEW and a cheap white covered foam block. I used these two items together for the QEW only. The white block looks like wool, and flaked away like wool, but I doubt it. It proved very cheap indeed, Made in China, and might even last through a second wash. Why I used it was because it was white, and I wanted to see the results of using it with the QEW and if it removed the dirt. It did, and it turned a dark colour, greyish, so it did the work, also noticed in the rinsing bucket. Back row from second left. Clear one litre (approximately one quart) spray bottle. Mothers California Gold Car Wash.
Small plastic medicinal measuring cup. Second row from second left. Generic Blue microfibre covered foam block. Large generic Blue microfibre drying towel. Yellow edged White microfibre polishing cloth. The only Mothers microfibre polishing cloth item available here in Australia. Explanatory note on some of the items used. Large spray bottle. I wanted this to be clear as I wanted to see if the soap mixture went into solution, and if it then stayed in solution. Smaller blue spray bottle. Didn’t matter what size or colour, as it was just for fresh water only. The first step is to fill the clear spray bottle. Do this first, and then put the soap into the filled spray bottle. Fill the sprayer with warm water, not too hot, just as warm as what you might bathe in. Fill to the point just below the one litre mark, or the one quart mark, or to where the sides finish and it starts to slope up to the neck. Okay then, let’s measure out some soap. You need 10 millilitres as I mentioned, and this should be allowed to slowly come out of the pull up nozzle on the Mothers bottle. Don’t squeeze it. Just hold the cup up to the light so you can see the measurements and carefully allow the Mothers to flow into the cup, remembering that it’s only a really small amount. This photograph shows the small amount in the cup as best as I can get it. See the vertical light area. You can just make out the delineations there with the small lettering ml just above the number 4 that you can see there. A piece of advice here. Most medicine cups are this size, but don’t be tempted to get a smaller one. The reason is this. We want the soap to be a little more fluid than it is straight out of the Mothers bottle, so we can get it more easily into the spray bottle. To do this, once the soap is in the cup, fill it up slowly with hot water almost to the top of the cup. The hot water makes it even a little more fluid again. Slowly pour this mix in the cup into the sprayer. Once in the sprayer, and this takes a little finesse, replace the spray mechanism, and tighten it to the bottle. Next, mix this up. Don’t shake the bottle, but move it in small tight fast circles for 5 seconds. This photograph shows the resultant mixture. It’s a light yellowy green, almost the colour of weak urine, which is a bad analogy I know, but it’s a weak lemony colour. What I tried to do here is to show it with the Sun shining from the other side so that the colour might best be seen. Note the small patch of colour on the towel near the centre of the base of the sprayer. Also, a note I have to add here. I allowed this mixture to settle down for some minutes to see if the mixture separated back into the soap and the water. This just did not happen at all. The soap stayed in the solution and did not look in any way like it was going to separate. Even after spraying the sized panels in work during the wash, at no time did it even look like it was going to separate. Spray the section you’ll be working on first, and this is another revelation. It’s similar to the QEW in that there is very little if any suds, maybe tiny little beads of froth. Spray an amount maybe a little more than you might with Showtime. Take the blue microfibre covered sponge and gently move it around in the sprayed area, similar to what you might with a mitt during a ‘normal’ car wash.
Again it still did not froth up, but you could definitely tell it was more than just water, and actually did feel slippery, more so that just water. With the other blue spray bottle, give this area a light ‘spritz’ with the water, and this could be termed the rinse. Dry off with the place pat and lift drying technique. Give the spray bottle another spin to keep the soap in suspension. The usual Mothers proviso holds here also. Keep the mix mixed so to speak. However, I found that the soap stayed in the mix throughout the whole process. Move to the next section, and repeat. I have another note here. I completed the first half of the car using the rinse water as well, and then did the second half of the car without using the ‘rinsing’ water, and really, I think it made no difference whether I rinsed or didn’t rinse. However, one thing I did notice was this. I did the whole task inside the garage, in complete shade. The garage door was open to provide strong natural light. What this did do however was to make that rear vertical section warmer than the other panels. What happened was that as I proceeded across this flat panel, when I came back to dry it was almost dry from the warmth of the panel, so I just sprayed it with the water and then dried it off with the drying towel. I stopped a couple of times to take photographs, some used, some not, and I still completed the whole car in thirty, forty minutes so for a small Corolla sized car, it took about half an hour. Again saying it and seeing it are two different things, so what I’ve done here is to show a sequence of photographs to better illustrate the process. This shows the dirty panel behind one front wheel. What I’ll highlight here is the slipperiness of a clayed, prepped, sealed and waxed surface. You’ll notice the diagonals across the blue paint. This shows the beading rolling rearward under motion, and also downward under gravity, thus diagonally beading away any dirt particles in the water. Also at the front of the trim strip and also just behind the letter ‘D’ are 3 tracks where the beads have fallen from behind that trim piece when the car was stopped, also drawing the small dirt water beads away. Quite effectively explained with this picture. What this photograph shows is immediately following a liberal spray of the soap mixture. What I’ll ask you to look at here is something I suspected even before I started, and what this photograph proves. Because the paint has undergone the whole clay etc process, and is clean, then actually spraying with this soap mixture loosens any dirt and it flows away in the soap mixture, under gravity to leave the section of panel almost clean. 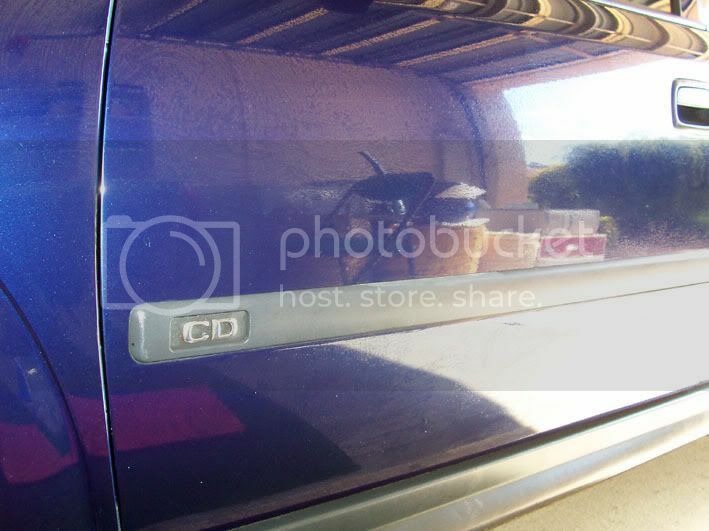 Also note the drip trails on the trims both at half door height and below the door. Also note at the bottom of the door the small droplets that actually look ‘soapy’. This was after moving the microfibre covered foam block around in that sprayed area. Now, see the reflection of the chair. At the top of the chair and moving to the left is a line above which is lighter than the rest. Look in this area and also at the top left of the photograph. What you see are some ‘cloudy’ lines for want of a better word. This surface here is still wet. Also, note how the trim has come back clean with the application of the MF foam block. This is immediately after drying this section. It was not rinsed, nor was any product used at all. Just dried off the liquid, and snapped the picture. The trim also came up clean and back to its (relatively) dark colour. That was the paint. I did not do the glass, because I used glass cleaner for that at the end of the whole process. For the last I did the wheels. I sprayed the mix into the MF foam block and cleaned each wheel like that. It just ate the 2 weeks of baked on brake dust mixed with the dirt with no pressure needed, just wipe it over. I just wiped them clean with a piece of cotton T shirt. Immediately upon finishing, I pulled out the FX Spray Wax and did the whole car with that. I could just leave it all at the end of the previous post, but there are some points I would like to further emphasize. I can get on the same boat as all the other companies that have come out with a ‘waterless wash’, so to speak, and add the rider that this process should not be used to replace a full and normal car wash with a hose. It was something that necessity dictated for my situation. I would class it as a success, but as I mentioned earlier, there are degrees of success. I will be using this process for most of my washes from now on. Every so often, say, according to the ‘detail guide’ of every 12 weeks or so, I’ll send the car down the tunnel for one reason only. The water under pressure to get into wheel wells and into and behind the trim. My nerves could handle every 12 weeks or so. The things I would like to point out however are these. If your car is cleaned well, then that means it doesn’t get as dirty because of the ‘Surface Friction’ principle. The ‘every use’ principle is one of the best things you can do to keep your car clean. 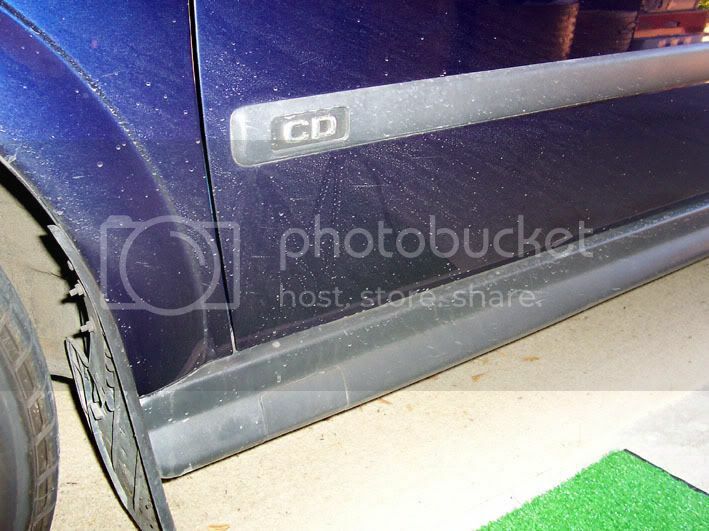 Dust the car before leaving the garage, and Showtime with a MF when you get home, or dry it off after rain. The time used here is negligible. If it is kept clean, then at the time for a wash, that wash becomes an easier task. This is a big point right here about the process I used. The soap is in suspension, so this method with a spray bottle is similar to the full wash in that the soap makes the water slippery, be there suds or none, and the movement of the mitt itself, assisted by the slippery water, is what lifts the particles into the nap of the mitt and away from the surface of the paint. On that same point, I also carried out another small experiment, after it was all over. I used the same amount of Mothers California Gold Car Wash soap into the medicine cup, only this time I filled the clear one litre spray bottle with cold water, and then poured the soap into this cold water. It did the same as for the warm water, after spinning the mix for 5 seconds. It also stayed ‘in suspension’ in the cold water and stayed there after I set it down and went inside for a coffee. It was still a pale lemon colour when I came back a quarter hour later, after downloading the photographs. I’ve saved this photograph for the last. Innocuous enough. This was the last photograph I took after finishing the car, the point being this. This is what was left after finishing washing the whole car. There’s just on 400 millilitres of soap mix left. That means the wash consumed 600 millilitres of soap mix. I washed a whole car and only used............wait for it..........one pint of water, and not a drop spilled on the floor of the garage. Now, I’m going to actually pretend that some of you are still here reading this, and here’s where the people at Mothers might not be too enthusiastic with me for saying this. This worked well for me. What I would like is for some of you others to actually try it, because I have a suspicion here, and it goes right back to almost the first line of the original thread starter. That plaintive one liner from Stanger, Winter, not looking forward to that. I’ve gone to great pains to stress that if your car is clean, it’s easier to keep it that way. I used warm water, so I could (pretend) I was in Winter, which I have no idea of how it really is like in your freezing conditions there in the US. There’s guys in Canada, the North East cold States around the Great Lakes, up there in the Colorado Rockies, Alaska. I have a theory about the road salts also that on a clean car, a warm soap mix might help in moving the slush from the paint, although the warm water may not stay that way in the freezing cold. That’s what I would like someone to actually try out, and I know the Mothers guys would not recommend that at all, so I’d add that you’ll be doing it for your own edification only. Also, there’s you guys who have the monsoonal weather in Hong Kong or the Philippines who also might like to try it for their own edification also. However, I will be using this process from now on. To wash a car and only use one pint of water is something that gives me immense satisfaction. I understand completely that I’ve gone totally overboard in writing so much, and I really hope that at least one or two of you might have actually read this far, but if one guy gets something out of all this, it was me. I just detest using another Company’s products when I can make something from Mothers work. It means I can save the Showtime for more important things. Lastly, a credit. My friend kbshadow is a quiet behind the scenes sort of guy. For so long, he’s been gently suggesting I use QEW, and I’m just so glad that he did that. The QEW was what gave me the major ‘Eureka’ moment, the ‘soap in suspension’ thing that directed me to think about the ‘science’ behind the practice. kbshadow also provided me with direction to the sites for Pharmacy chains and Hardware chains in the US so I could chase up on the availability of ‘stuff’. 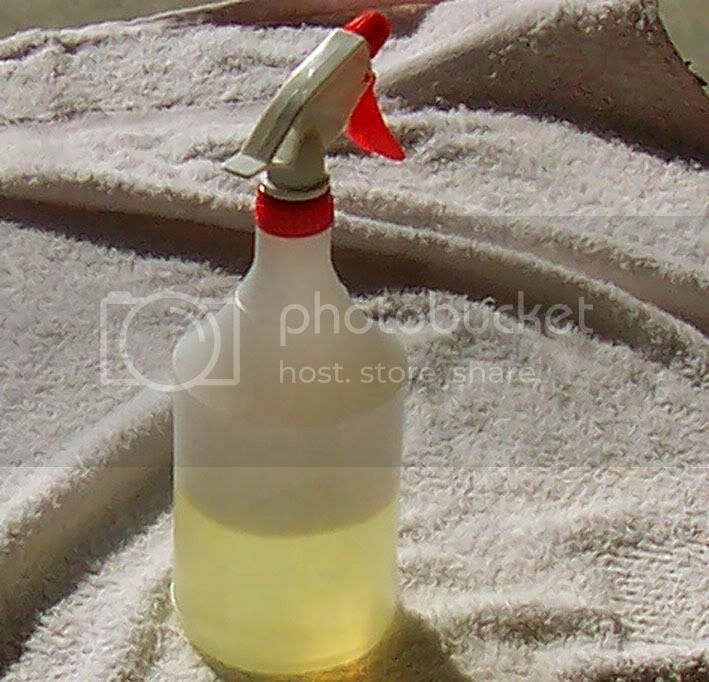 He also provided the germ behind the idea of actually using a spray bottle, as he does the same with QEW. Also, he originally directed me to the Duration product for my wheel wells, and both he and I use Duration for just that. Recently, he mentioned to me that he’s started using the good old WD40 product (Water Displacement formula number 40) in his wheel wells. This might also be a good idea, making those wells a little more slippery so the snow/salt/slush has a harder task to adhere to the plastic surfaces in those wheel wells. So, really, none of this is my thing. I just picked up on it, thought laterally, and then wrote it all down. -I find that using "pump up" spray bottles (such as those one might use for misting plants) to be easier to use than trigger spray bottles. There are bottles ranging from 16 oz. (salad oil misters) to 5 gallon backpacks (weed killer sprayers). I tend to use 32 oz. or gallon sprayers the most. -I've done something similar to your test, but have always rinsed. (I guess just out of habit, Never tried to skip rinsing. ) I would use 1 sprayer for the soap solution and 1 with clear water for rinsing. Using the pressurized sprayer for rinsing allows for more residual dirt to be rinsed off before the drying step, IMO. Admittedly, this obviously uses more water than a pint. But still quite a bit less than rinsing via a hose. -I always keep one mitt/block separated from the rest for use on wheels exclusively. I think there is too high a risk for metal particulate from the brake dust to stay in the fibres and scratch the paint in the future. -For cleaning the wheel wells, you could try a long handled brush and the soap solution, followed by a rinse via sprayer. -For those of you looking for the measuring cups, they are also typically found in the baby section of dollar stores/department stores. If you can't find large enough cups, you could measure half the amount, pour it into the sprayer, then add another half. A person who is aliterate is no better off than one who is illiterate. I tend to use 32 oz. or gallon sprayers the most. ....Admittedly, this obviously uses more water than a pint. Tony's write up is timely since the water situation is getting worse here. Mama's Boy: If you use a quart sprayer for rinsing, do you use more than a quart of water? I think Tony's study shows that the no rinse car wash products are probably not much more than standard car wash.
No matter what measurement system, I recommend using the ratio approach. Mothers says 1 (fluid) ounce per (US) gallon (128 fluid ounces) on our bottles so the ratio should be 0.0078 (wash / water). I need to use more due to the hard water here. Of course, Bama will think I am nuts but I use the little medicine cups to measure the car wash every time! I have seen the demos of foam guns and I always worry that the soap will dry before I can wash/dry it although at this point I think the water spots from the water just sitting on the car during the pre-wash rinse may be worse than car wash solution. I was wondering- did you not use a bucket of water to rinse the washing block while washing the car? Or did I miss that part? Just another reason why this 'community' is such a good one, because no matter how many ideas come from left field, people are always willing to take it on board and find an improvement. So thanks. I'll remember this for next time. Because it's the MF foam block, it'll just be a matter of a small amount of water in a bucket to rinse out the mitt and squeeze it out. As I mentioned I did the wheels last, spraying the mix into the block, and when finished, I cleaned the block. For cleaning the wheel wells, you could try a long handled brush and the soap solution, followed by a rinse via sprayer. kbshadow mentioned this long handled brush idea to me also. Another good tip. I use the quart sprayer for the soap, the gallon for the rinse. If you go light on the soap concentration, it rinses with less water. I go a bit heavy on the soap when the car is more than dusty, so I use a bit more to rinse then. But if you follow with Showtime, you shouldn't have any residual film to worry about, so you wouldn't need to be as concerned about having a "thorough' rinse. Why not just spray Showtime on a panel, and with a bucket of water and a sponge or mit, just sponge down the panel and wipe off with a mf towel. Thats how we cleaned limos years ago. It didnt scratch, left a gloss, and was fast , and only used a bucket of water. I have used a similar method prior to buffing cars as if I do add any marring I am going to remove it anyway. The problem I have seen is streaking from the wash shampoo, however I know see that my ratio is way too strong. Tonight I will test your method on my R32 Golf which hasnt been washed in 3 weeks and has sat at the airport everyweek day. All times are GMT -7. The time now is 01:50 PM. Content Copyright ©1995-2016 Mothers® Polishes•Waxes•Cleaners, Inc.